Pulse walnuts in food processor until fine. Add the rest of the dry ingredients and pulse until very fine. Mix egg yolks with buttermilk and vanilla extract and slowly whisk in browned butter (browned on stove top). Mix wet into dry ingredients and mix until incorporated. Whisk egg whites until semi-firm and fold into mixture. Do not deflate. Some lumps is fine. Bake in preheated waffle iron until desired crispness is achieved. Let rest for a minute to crisp up before serving. 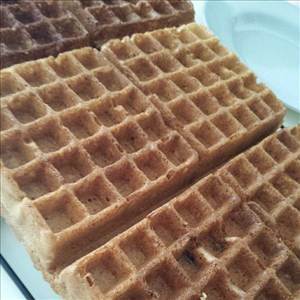 There are 308 calories in 1 serving of Browned Butter Walnut Waffles. Calorie Breakdown: 54% fat, 37% carbs, 10% prot.